Pollination by birds (ornithophily) occurs both in the paleotropical and neotropical Gesneriaceae, as well as in the Southern hemisphere Gesneriaceae (Rhabdothamnus, Mitraria, Sarmienta, Asteranthera). It is rather rare in the paleotropical Gesneriaceae, where only a few genera (Aeschynanthus, Agalmyla) and particular species of species-rich (essentially bee-pollinated) genera (Henckelia, Streptocarpus, Cyrtandra) exhibit an ornithophilous pollination syndrome (flowers bright red, tubular or salverform, with abundant nectar). Almost all species of Agalmyla and Aeschynanthus are climbers and epiphytes, and display their bright red flowers (often in dense bunches) high above the ground. In some Malayan species of Aeschynanthus the nectar sugar composition has been studied. The low sucrose content and the roughly 1:1 ratio of fructose to glucose proved to be in accordance with typical bird-flowers (Freeman et al. 1991, Perret et al. 2001)). Observations or special studies of actual pollination are largely lacking. The probable bird pollinators in Africa and Asia are sunbirds (Nectariniidae) and, in the area from Sulawesi to New Zealand, honey-eaters (Meliphagidae). In contrast, bird pollination is apparently very frequent in the neotropical Gesneriaceae (perhaps 60% of the species). Here the pollen vectors are essentially hummingbirds (Trochilidae). It is remarkable that the distribution center of neotropical Gesneriaceae and that of hummingbirds coincide (Colombia and Ecuador). 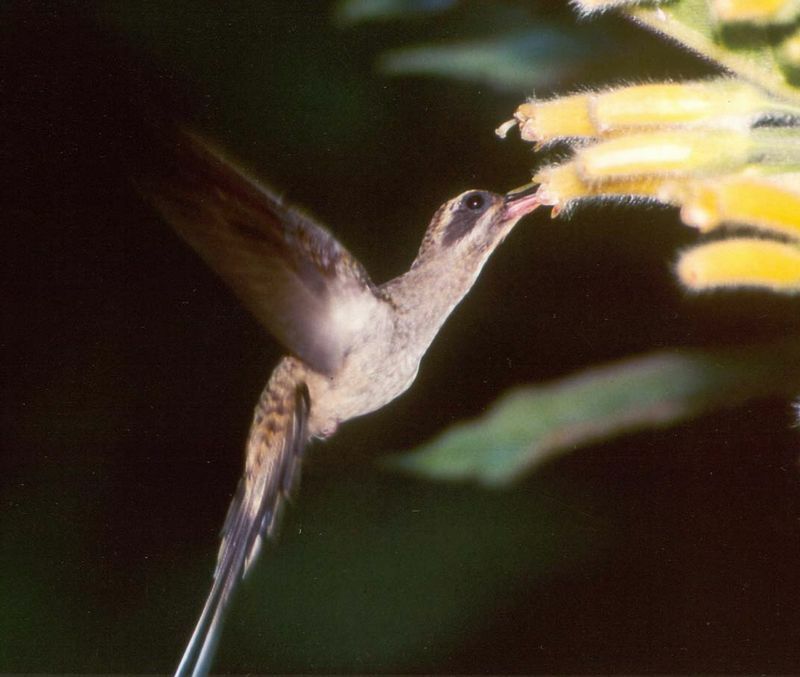 There is a strong correlation of ornithophily and an epiphytic habit, but also many terrestrial species are pollinated by hummingbirds. Hummingbird pollination in the neotropical genera is discussed in the next section. Columnea polyantha being visited by a hummingbird, Phaetornis superciliosus. Photo by C. Kastinger. From top: Sinningia lineata (tubular); Columnea schiedeana (columneoid); Nematanthus serpens (hypocyrtoid); Drymonia species (converted melitto/euglossine); Sinningia hatschbachii (additional converted type). “Converted melitto-/euglossine flower”: corolla shape as in bee flowers, but coloration deep orange or red (instead of white or light yellow). This type apparently represents a recent switch from melitto-/euglossophily to ornithophily (e.g., species of Episcia, Nautilocalyx, Drymonia and Kohleria). An additional “converted” type, combining characters of (a) and (b) (flowers tubular, limb strongly bilabiate, the large upper lip projecting forward), is found in Pheidonocarpa and many species of Sinningia and Gesneria. Apart from flower characters, extrafloral cues may also play a significant role in the attraction of hummingbirds: large, coloured bracteoles in the inflorescences (e.g., Drymonia spp.) or red blotches, margins or translucent windows on the foliage leaves (Columnea sect. Collandra). The flowers are, in contrast, often rather inconspicuous and hidden in or under the foliage. 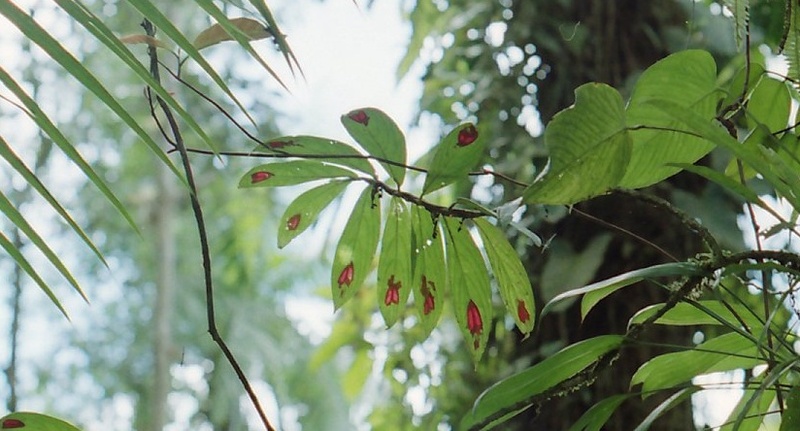 As has been observed in Columnea florida, young and inexperienced hummingbirds (Phaethornis longuemareus and Heliodoxa jacula) first aim at the translucent red “windowpanes” on the leaves and then spend several seconds inspecting various portions of the plant before finding the flowers. Experienced birds hover briefly above the red spot and then dip quickly under the leaves and approach the axillary flowers directly (Jones and Rich 1972). Columnea florida has translucent red patches near the tips of the leaves, brilliantly visible from below when the sun shines through them. These serve as an attraction for hummingbirds, which then discover and feed at the pale yellowish flowers.